In March of 2015 IMTFI arranged for a comprehensive visit to India to gather updates on four of their sponsored research projects, introduction can be found here. This first of the four case studies takes a look at rickshaw pullers in Delhi with Mani Nandhi. 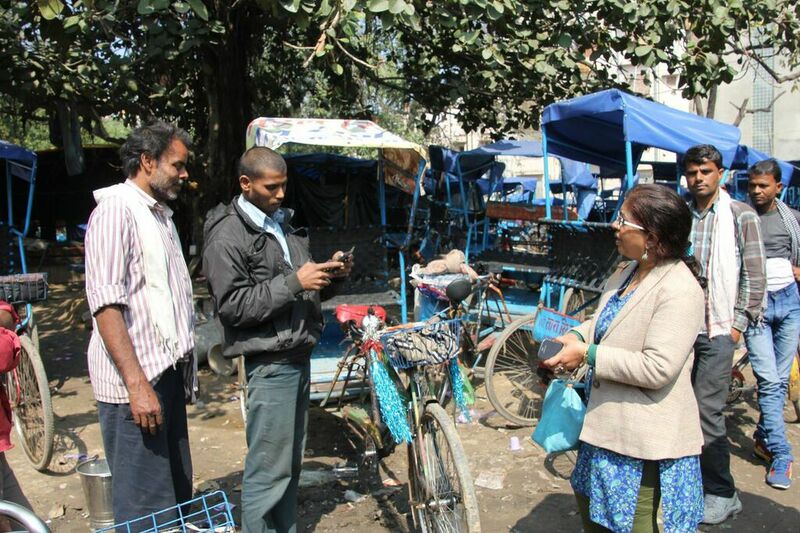 For IMTFI researcher Mani Nandhi, the first research questions about the rickshaw pullers of Delhi grew out of her own personal experiences with a rickshaw puller. "When I went out of my colony – to go shopping, to go to the bank – I didn't have much time, so I took the rickshaw. I came to ask him questions about his background, and why he came to this work, and I learned about the rickshaw pullers’ lives, the harsh conditions, and why they migrate here. In some ways, it’s the easiest occupation to take. There’s no entry barrier. You just had to be taken to the contractor and pay the hiring charges for the day.” Trained as an economist Nandhi also manages the administrative responsibilities as a department head at the Department of Commerce at Jesus and Mary College in New Delhi. Her commitment to studying financial inclusion has always been driven by human interests. According to statistics there are about 8-9 million rickshaw pullers in India. Out of these, only one million hold licenses, and fewer than 10% of those in the occupation own the rickshaws that they cycle. Despite the country's rapid modernizing, human-powered transportation remains an important part of urban living, particularly to fill in the gaps in existing public transportation of bus lines and metro networks. As I travel with Nandhi to a rickshaw pullers’ camp, I notice the obvious affection they have for her. They mostly call her by the familiar but respectful “Auntie” (rather than the more usual and impersonal "ma'am" or "madam"). There is considerable laughter, joking, empathy, and personal attention in the interactions as Nandhi inquiries about particular men, some of whom are back at their villages and some of whom have been in trouble with the law. The conditions in which the men live in the encampment indicated their marginal economic status, even though government-funded toilets had introduced improved hygiene conditions in the camp, and the men were diligent about sweeping garbage out of our way and shooing away feral dogs. Like other IMTFI researchers in India, Nandhi emphasized the importance of doing qualitative as well as quantitative research. "In my pilot study I had a very long questionnaire and two research surveyors. I decided on areas that I had to explore, areas that I could get pullers for my sample. In my test questionnaire – where I found problems – I got to know about remittance channels, including about the Eko channel, in which money has to be collected." "The pullers had many different strategies. One of these pullers would stay in the open space so he could hire out a room once a year when his wife came to stay with him. 'I won’t be saving money if I rent a room.' By being an open squatter, he could save on money to be used for his family. People who are illiterate -- with no means of support, no government support -- look after money very well." As a savings strategy she described how they would also bury money in polyethylene bags at uninhabited parts of their camp. The IMTFI visiting team observed many forms of economic activity as we accompanied Nandhi making her rounds among the pullers she considered "orphans" from society. Within the seemingly chaotic environment of the camp, there were shops that sold small items and beverages, a barber shop, an eatery. There was even a stall for selling colors for the upcoming festival of Holi. As we moved around the camp, we came across surprising ways in which money circulated through a variety of payment flows. The camp holy man showed us a selection of talismans and coins from the temple, which included a U.S. quarter among his collection of currency. Nandhi also described arrangements that some of the men made with local shopkeepers who served as depositors for their savings. This helped them to protect it from losing them to someone who might squander away their savings in gambling or alcohol binges. "They sleep outside the shop," Nandhi explained, "the shopkeeper has a system" in which the puller provides security for the proprietor, and the money kept is recorded in a small diary. "The men say, 'I don’t get the interest. But at a bank I cannot open an account. I need an ID card.'" Nandhi described how the pullers often feel excluded from the bank and how they don’t tend to see it as a public resource to which they have access. "They are not allowed into banking outlets. Lower level employees are not facilitators in that sense. Bankers at the top level, they are keen; they understand." Although executives understand the imperative for financial inclusion, "it is at the ground level where sensitivity training is needed," according to Nandhi. She described banking officers who used their own experiences in places like East Bihar to confirm their own negative stereotypes and who would even accuse the pullers of lying. "They are poor," she lamented. "It’s like a bigger vehicle who hits a smaller vehicle and says they are too blame. You are small. I am big. I am powerful." Banking hours and banking holidays could also be obstacles to pullers. It is also worth noting that banks require proof of identification for opening accounts. Among the acceptable identification document for opening an account is the the biometric ID cards issued by the AADHAAR system which requires clear fingerprinting as a way to identify an individual.The heavy labor of maintaining these vehicles often wear the fingerprints in the hands of the rickshaw pullers and makes them illegible to the technology and debars them from acquiring their unique AADHAAR number, once again prohibiting possible access to banking facilities. The other major factor that makes informal channels preferable is the question of access to credit. (In Africa, innovative experiments with providing credit to those in the informal sector using mobile money systems are being analyzed by IMTFI researchers studying M-shwari and the Jua Kali in Kenya.) "Unless there is access to credit, access to payment alone is not enough. They can’t get credit from the formal banking system." Moreover cash may be insecure for these men, but so is maintaining control over cell phones and biometric cards. Nonetheless, she described an increase in ATM card use among the very poor despite suspicions that government involvement might lead to unwelcome forms of oversight, because if the government "started this account" tied to debit card use, it could also use electronic banking records as a means for surveilling unreported income. After all, as Nandhi observed, "90 percent of the population is migrants, and everyone is able to make money one way or the other." Financial inclusion even with intense hand-holding can be difficult to attain. In her second study in 2012, she described how the initial group of 75 was soon whittled down to 50 participants, and ultimately only 13 became banked despite energetic efforts. In our visit to the pullers’ camp with Nandhi we met a contractor who manages to control much of the men’s economic lives. He provides "loans, the rickshaw, gambling, entertainment, the store, the attraction of urban living, an escape from harsh reality in village, their livelihood, their opportunities. "He was polite in the presence of visitors and showed us the record books in which he recorded his daily transactions with his men. She described what she called the "loan trap" in which many of the men are confined and how they are economically constrained by perpetually owing to the contractor, who might bring them from the village by the dozens, although they pay their own travel expenses. "One of important insights, which I have stated in my study, was expressed by a puller: 'Madam, when you come, we feel motivated to think of saving, and after you leave, we go about our daily routine and the thoughts of saving is far removed.'" Nandhi argued that two things should be prioritized: "a champion like a bank motivator to keep in touch with them, as is done in the microfinance model, where a motivator goes around the group members to reinforce the benefits of the group and savings and other benefits of being in self-help groups" and "a savings collection financial product akin to a piggy bank scheme." She argued that her own experiments with having pullers deposit small sums indicated the potential for larger scale success, and she cited the Syndicate Bank Pigmy Deposit Scheme as a possible model. She wanted to see this approach combined with doorstep collection at the location of a pullers' temporary or permanent abode, because even small distances to bank services could be large obstacles. "If top policymakers could agree to introduce this kind of program compulsorily in some public sector banks in an experimental manner, it would be a test for motivating the poor to deposit." She countered the misconception that the poor "don't like technology" by explaining how they adopt technologies selectively and according to their own personal needs. 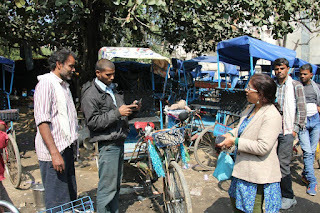 In the camp we could see that some rickshaw pullers had even acquired more expensive "smart" phones, which could be a powerful mobile communication channel with access to global networks of information, data storage, and the ability to document their financial and personal lives. Nandhi had her own smartphone with her and discussed the benefits and drawbacks of the device with one of the men. She also explained how less formal cybercafe spaces -- which kept later hours and maintained fewer class barriers -- could be an important part of financial inclusion, particularly for completing first steps in becoming banked, such as acquiring an AADHAAR card. She noted that "RBI [Reserve Bank of India] is supposed to have digital literacy" as well as financial literacy training. (For more on financial literacy training in India, see the research of IMTFI researcher Deepti KC and Mudita Tiwari.) Unfortunately agents have more incentives to promote remittances than to promote saving. As a rhetorician, I found the end of our interview particularly moving. In her commitment to the cause of the rickshaw pullers, Nandhi still had energy despite coming to the end of a twelve-hour day. She became especially animated as she described her frustrations about reaching policymakers with her message. The changes that she is arguing for implementing involve relatively modest costs, and some initiatives should cost almost nothing other than a modest outlay for training in techniques. Nandhi insists that the sensitivity and civility that she models in simple interactions with the pullers could lower barriers to financial inclusion dramatically. She has written a book, The Urban Poor & Their Money published by Pinnacle Learning, illustrated with photographs from her first study in 2009-10 that personalizes the rickshaw pullers by presenting them as individuals to make her case to policy makers. Yet she feels that they often turn a deaf ear to her pleas for empathy for the poor. "A little more than a year ago, I was invited to participate by someone from the UNDP (United Nations Development Programme) for a discussion on pullers. It was a small group of 6-7 men who were associated with -- the Rickshaw Bank Project, a rickshaw manufacturing unit, NGOs, etc. One gentleman had got a contract from I think the World Bank to produce a status paper with policy recommendations on pullers in a month to be presented in international fora. I participated in the discussion but the sense I got created unease in me, because the purpose of meeting was to rapidly scan data to arrive at findings. When I did venture to suggest that the time is not adequate enough, I knew my suggestion was considered unworthy to take note of. Though I was asked to be a member of a working group, I knew I would not be informed and never was called for it. It rankled me not because I was not called, but because it was not going to be fruitful for the large majority of pullers. I do intend to persist, but one needs the networks to connect with, something I do not have. I shall have to do something, just to feel that my research findings could open up possibilities for the pullers."